Hyperion Error of the Day: Time to Upgrade EPM? It might be time for an upgrade for slightly older EPM releases. Below is the timeline for backwards support for fixes on the EPM platform. To sum up the table, the 11.1.2.1 and 11.1.2.2 versions are already sunsetted for patches. Additionally, the 11.1.2.3 version will no longer be supporting new patches and fixes as of February 2016. Given that typically not much work is completed near the end of year, it may come as a surprise in February. It is also possible that Oracle releases a patch greater than .700 which may extend the window for 11.1.2.3. At the very least, the table indicates that it is necessary to move rather quickly and frequently on the patch releases to keep up to date. PLEASE NOTE: When the grace period end date has been reached, no additional fixes will be developed. 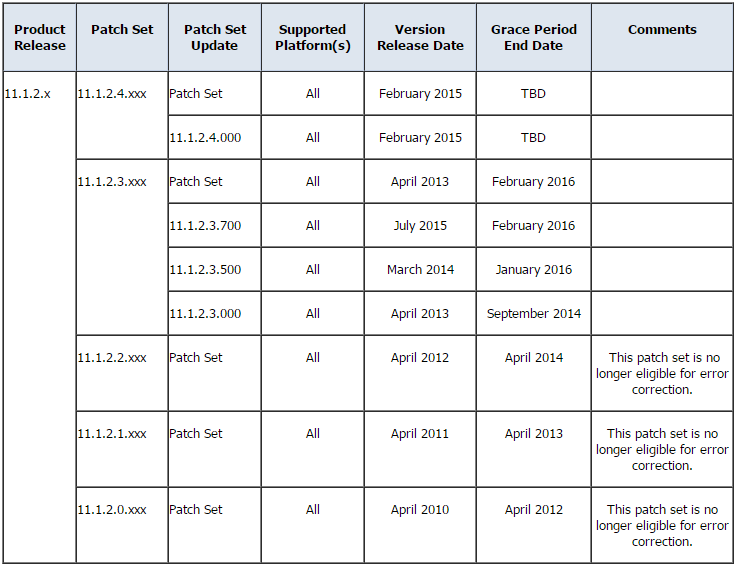 The grace period is defined as the period of time following the release of a new patch set or patch set update during which Oracle will create new fixes for both the new and previous patch set or patch set update, allowing customers time to plan for and install the new version. Note: The info is subject to change.